Faith is one of those nature versus nurture questions. You either have it by the time you’re an adult, nurse or you don’t. But unless it’s very strong, viagra you’ll find it sorely tested. My beliefs overcame my (admittedly shaky) faith in the Church’s other central tenets – that Christ died for our sins, that we must all suffer for the sake of our future spiritual health, that the bread and wine actually are His body and blood – to the degree that all I kept were the tenets that seem to make the most sense from a human perspective: treat one another with love and respect, bear up those weaker than you, and try to give back more to the world than you must take. The pederasty scandals of the past half-decade have only cemented that belief and in a way, solidified my actual faith: that we’re all together here by the blessing of some higher power (God, if you will) and that if we’re not working together, we’re headed for extinction, as a race, apart. Organized religion is a tool for power, control, mental health and, perhaps on a better note, organizing humanitarianism. But beyond that it’s the source of more war, bloodshed and suffering than any other single force on the planet. But for others, religious faith is not only a personal anchor, it’s a raison-d’etre, and they grunt, sweat and bleed for the belief that their purpose on God’s earth is to somehow pump faith into everyone around them. The evangelicals of Nevada had a clever idea for Burning Man that wound up being much appreciated: Park a flatbed at the general store in Empire and give out free water by the pallet-load to Burners passing through. 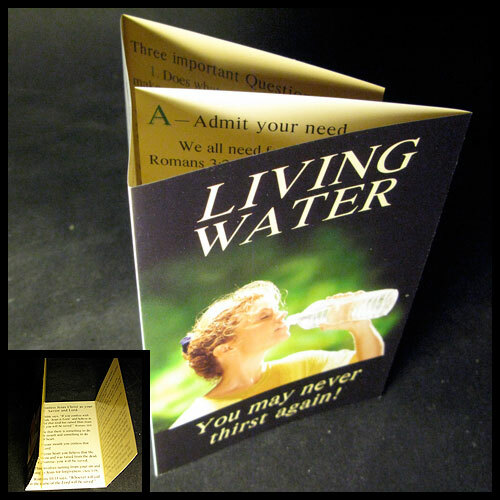 Oh, and stick a little cellophane bag of Bible tracts on the neck of the jug, because some people are so ready to believe they must surely need only the nudge of some printed words to topple into organized faith. The water served its purpose, and I’m grateful for the gift. The tracts went into the trash.